Discussion in 'Frontpage news' started by Hilbert Hagedoorn, Dec 3, 2018. Caesar and fantaskarsef like this. Music to my RTX 2070 ears. Already pushing north of 60fps on LOW @ 2560x1080. Can't wait to see what this update provides. Well considering DICE's rendering engineer detailed how they are improving performance and it included "downgrades" - me? Like I said, DICE has already detailed how it's getting this additional performance - It's a combination of bugfixing, optimization of the renderer to start raytracing earlier in the frame and using a few tricks to avoid raytracing in areas where you shouldn't see it (I'd argue this is downgrading) or restart it where it failed as opposed to redoing the entire ray. I highly suggest reading this article - it goes into depth about the optimizations going into this patch. Up to 50% - and there is the frozen lake scene with less than 15% performance gain. So it can get about 35-45 average on 4K with RTX medium-high-ultra with DXR with a 1200$ 2080Ti. Impressive one. 2070 gets much less bump from this patch. Anyway, shxxy result still. I hope you'll get your SLI under DX12 soon.... I just don't think this will happen. fantaskarsef and Denial like this. Lol XenthorX posts on Guru3D all the time. Great guy! fantaskarsef and Caesar like this. 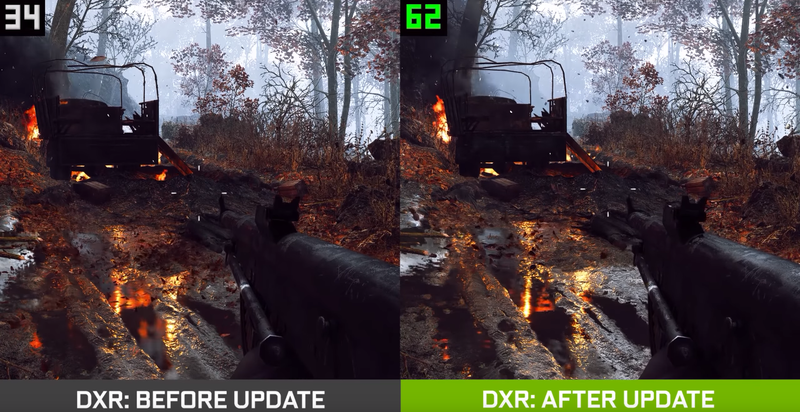 Improving DXR performance... by turning crap off! As long as it doesn't affect image quality, it's a win win. Then you'd argue culling is "downgrading, right? HARDRESET and Robbo9999 like this.